Monkey See Monkey Do is like being in a nightclub. It is loud, with snatches of music, clashing voice overs, flashing lights, videos, the thump thump thump thump, (of a treadmill) and lots of shouting for almost an hour. Award winning Richard Gadd from Scotland is giving us a taste of what three years of his life felt like when he was trying to run away from himself. Richard spends most of the hour jogging or walking fast on his treadmill while most of the dialogue is made up of the pre-recorded voices expressing what’s going on in his head. These voices are dealing with what it is to be a man and his civilised self, verses his inner wild ape which always seems to be chasing him and terrifying him. He begins the show by recounting his successfully reviewed previous Festival show and the fallout from that. Occasionally he bumps into people he knows, a mate or an ex-girlfriend and there are videos of sessions with a therapist, gradually a fascinating autobiographical narrative begins to build. Its Richard’s prowess as a physical comedian and the use of facial expressions that helps keep everyone onside through the audio visual assault. My goodness you can’t help but think about how impressively fit he is and is going to be by the end of the run. It can feel pretty exhausting to watch sometimes. In fact if you have epilepsy or anxiety, I would suggest you sit up the back, I had to move from the front. The impressively designed soundscape was also a tad to loud, so earplugs might be useful. Otherwise this is an enthralling and mindblowing performance that will keep you laughing even as things start descending into darkness and through the other side. 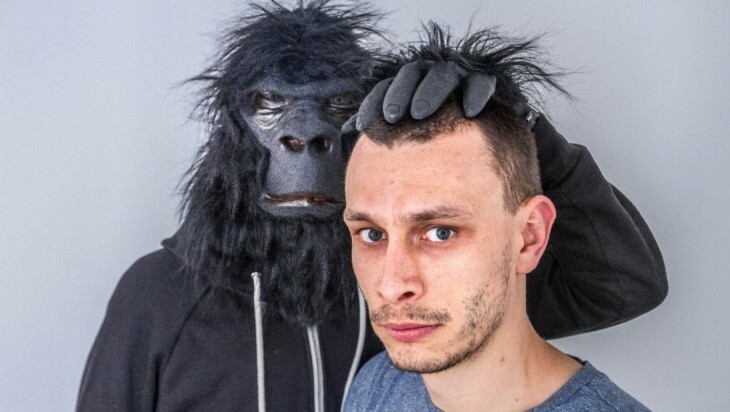 Monkey See Monkey Do is a very theatrical festival show that can be compared to Hannah Gadsby’s Nanette in a way, though they are coming from opposite ends. She is ending a journey that he is beginning. Hannah’s show is stripped bare, Richard is blaring at you with all the bells and whistles he can muster. Richard won the Edinburgh Fringe Best Comedy Award last year for this show: when you see it, you’ll know why. This is a brilliant show that will live with you for some time afterwards.